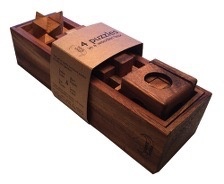 This set of 4 quality hardwood puzzles includes the Snake Cube, the Soma Cube, the Burr Puzzle and the Star Puzzle. All are packed in beautiful timber box with lid. The individual puzzles are approx 50mm x 50mm x 50mm in size.